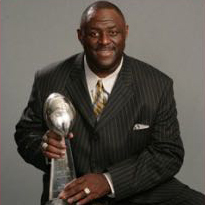 TRR is happy to announce the successful conclusion of negotiations in which former NFL great Leonard Marshall has been named to the advisory board of Apple Rush, Inc., a public company which manufactures and sells consumer packaged-goods products with a specific focus on the organic and natural beverage industry. Apple Rush, Inc. is also looking to become a nationwide leader in the distribution of anhydrous hemp oil products, which — among other therapeutic benefits — helps to reduce inflammation. Leonard, a long-time client if the firm, was a two-time Super Bowl champion with the New York Giants and an integral member of the great defense of the Big Blue. He now is an entrepreneur and actively involved in several charitable endeavors. The negotiations were handled by TRR managing partner Gregory Ryan. About APRU, LLC: About The Apple Rush Co., Inc. The Apple Rush Company, Inc. through it’s subsidiary APRU, LLC is a distributor of cpg products under the trademarked Apple Rush brand and other labels. The Apple Rush brand has more than 40 years of existence in the natural beverage industry. As a historical leader in the organic and natural beverage sector our goal is to also become the leader in the distribution of anhydrous hemp oil products nationwide. For more information, please go to www.applerush.com. About APRU, LLC: APRU, LLC focuses on the development and sales of all natural Apple Rush sparkling juices, and research and development, of premium hemp extracts that contain a broad range of cannabinoids and natural hemp derivatives and other active ingredients such as our exclusive agathos active, kratom, kava, blue lotus, and ginseng. www.aprullc.com or on Twitter @RealAPRU_News Safe Harbor Act: Forward-Looking Statements are included within the meaning of Section 27A of the Securities Act of 1933, and Section 21E of the Securities Exchange Act of 1934, as amended. All statements regarding our expected future financial position, results of operations, cash flows, financing plans, business strategy, products and services, competitive positions, growth opportunities, plans and objectives of management for future operations, including words such as “anticipate,” “if,” “believe,” “plan,” “estimate,” “expect,” “intend,” “may,” “could,” “should,” “will,” and similar expressions are forward-looking statements and involve risks, uncertainties and contingencies, many of which are beyond our control, which may cause actual results, performance, or achievements to differ materially from anticipated results, performance, or achievements. We are under no obligation to (and expressly disclaim any such obligation to) update or alter forward-looking statements, whether as a result of new information, future events or otherwise.